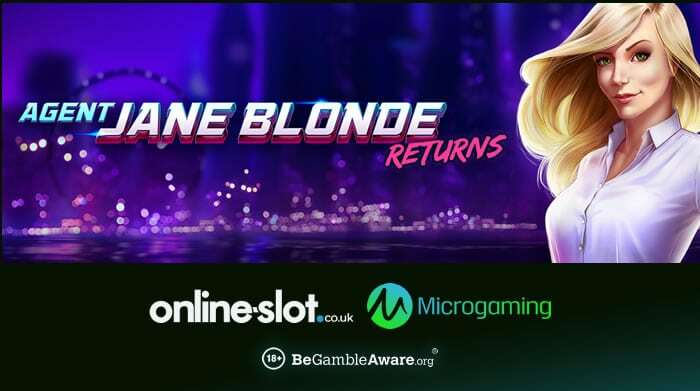 Microgaming has launched a sequel to Agent Jane Blonde 14 years after original was released – it’s called Agent Jane Blonde Returns. Agent Jane Blonde Returns is the 2nd slot featuring Microgaming’s iconic superspy after the original game was released way back in November 2005! Not looking any older, it comes with 5 reels and 15 paylines. Playable from 5p per spin across all devices, it has a retro feel and a retrowave soundtrack. Set in a city at night time, you will see watches, cars, cash, passports, handbags and laptops on the reels – you will also see Agent Jane Blonde in a various of undercover outfits. She’s also the wild (her face) – the Agent Jane Blonde Returns logo is the scatter and this is the most important symbol. When you get 2 scatters appearing on a base game spin, the Respins feature will be activated – the triggering scatters then change into wilds. These wilds then lock in position with a free respin to follow. Look out for more wilds as these are also held with more respins awarded. Agent Jane Blonde Returns, as well as the original and other Microgaming slots, can be played at Videoslots Casino – with over 3,000 game to choose them, they have the largest selection of titles anywhere online. With numerous awards such as casino of the year and best customer support from reputable industry organisations, they offer round the clock customer service and same-day cashouts. New UK players are treated to a 100% first deposit bonus up to £200 – once you deposit, you will also get £10 extra cash and 11 wager-free welcome spins on NetEnt’s Starburst.